This modpack was 5 months in the works. 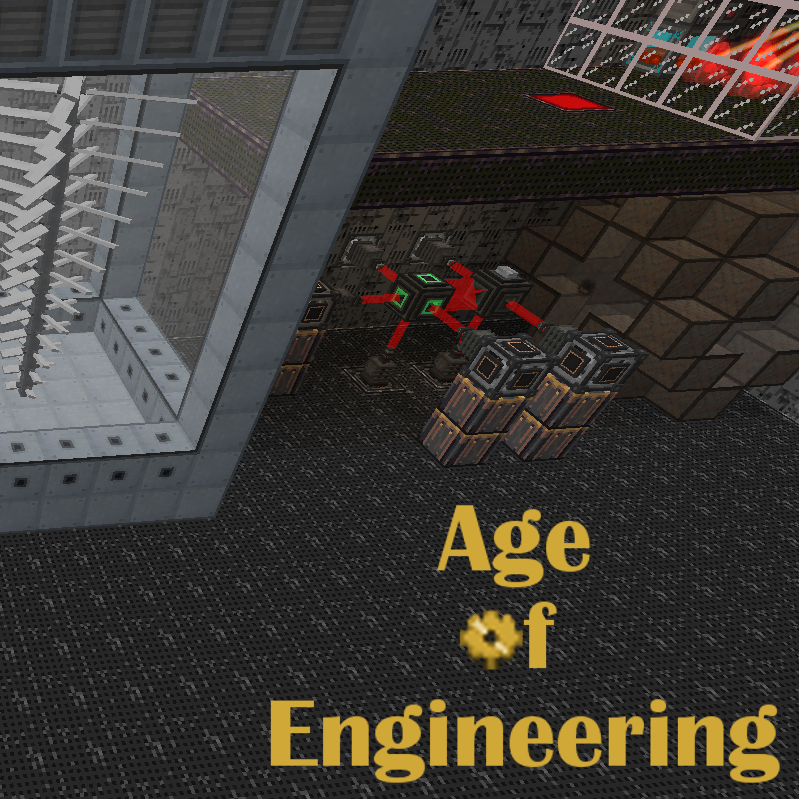 It is a tech-centered modpack with a technology tree, focus in progression and hundreds of changed (harder) recipes. This is achieved by gating progression by several blocks and items leading to the next age. The pack is divided in 15 ages, reaching the next age is awarded with an achievement and a trophy you can place. What you can do and have to do in each age to progress and reach the next age is covered in a guide (from FTB Utilities, just click the book in the top left corner). The goal of the pack is to give a longer lasting experience than other packs, also giving the challenge to automate almost everything. It also features several lesser known mechanics from well-known mods or you have to tackle some well-known problems in a different manner as you lack either some blocks/items you would normally have or they are just too expensive at that stage of the game, the problems mostly how to automate this task or how to generate more power with the ressources I have. This pack is heavily inspired from FTB Infinity Expert Mode, but is still very different in many ways. The goal was also to not make the recipes harder to just make them harder, but also make sense and balance recipes when two or more mods offer a different solution to a problem. This modpack is aimed at more experienced players to look for a new challenge, but can also work for semi-experienced players who like tech mods and want to learn more about them and don't mind the challenge. I will not provide server files as you can setup a normal Forge server and copy the mods, config, resources and scripts folders to the server (from the client not from the zip from curseforge). Im pretty sure this is just my PC but i was running the pack fine and had no problems just a little lag here and there and then one day i long on and its like a powerpoint presentation any ideas? You’re going to give more info than that. How much RAM do you have allocated to Minecraft? Press F3 and check your memory usage (top right). How high is it? What’s different about your installation of Minecraft, the Twitch launcher, and the modpack today compared to when you were running the pack fine? If you’re using a laptop, try plugging it in to charge it, as most of the time, laptops have decreased performance when running on battery power, even when the “High performance” mode is activated. This is because I have no life. Are you on Singleplayer or Multiplayer? Is this a fresh world or did you play longer and it suddenly started happening? Might need to load a backup then, I don't know. OK, how do you think I will do all the tech stuff, if I cannot even melt the iron to craft generator? First I just want you to know I love this pack! Thanks, but AOE2 is not planned. Why does it have the multiplayer tag when i cant even install server files to make it multiplayer? ods, config, resources and scripts folders to the server (from the client not from the zip from curseforge). Read the description. It is super easy to make a server. I just started playing this mod pack two weeks ago. I have not play too many Minecraft mods before this one. I am having trouble finding information on how to acquire that philosophers stone to make the crucible. Can someone please help me on the philosophers stone. Also, I am not sure how to upgrade my picks so they do not break after two hits.